Little Black Egg is a mom-and-pop screen print shop committed to doing the best work possible for our clients in a cost-effective, ethical and environmentally-friendly way. We love what we do. Our shop is run by partners Jeff and Monica on the edge of a constantly changing city. Need great prints on quality garments? We want to work with you to make that happen. Read on for information about what services we provide and how to get a quote. 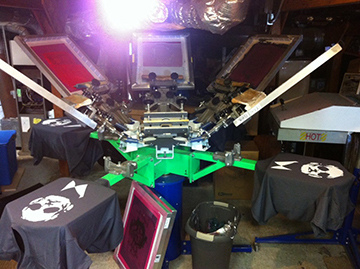 We manually screen print on quality garments. Specifically? We do the following, and we do it well. This is our specialty, is the classic modern way to go, and is probably what most of us picture when we think of a printed t-shirt. We are known for our 'soft hand', as they say in our industry. Phthalate-free ink is required by law in California for infants, but we find it best for humans of all ages (and the environment). 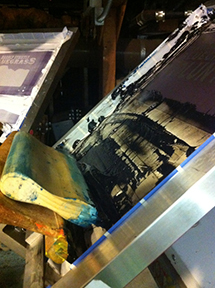 Plastisol printing can be done on most garments, with any color ink, and we can print up to six colors per design. This kind of printing gives you the most control over color options. This uses a chemical process to remove color from a garment. It is popular because it has a soft feel after washing -- the image feels like the rest of the shirt. Discharge can only be done on certain garments, usually darker colors. There are a lot of factors that go into Discharge, and we know them all. We offer heat press service to decorate hats. There is no limit to the number of colors. There are many factors involved in getting a quote, and we do our best to make it as easy as possible for you. Screen printing is a 'measure twice, cut once' kind of business, and the more information you can give us up front, the quicker we can get you an accurate price. Your quote will reflect a per-piece price to make the costs clear. You can email us for a quote. Please include as much information as you can, and if you are not sure yet about something that is fine, too. We can figure it out together. Again, we can source almost any garment you might want. let us know if you don't see what you want, or need some guidance or narrowing down of choices. We have a two week turnaround time once the order is in (meaning we have your artwork, shirt order, and a non-refundable 50% deposit). A note for folks on a deadline, this does not include shipping time. If you need something faster, let us know, and applicable rush fees will be added. We work with a simple contract, and require a non-refundable 50% deposit to start the job, with the balance due at shipping, delivery or pick-up (the latter can be arranged if you are in or near the San Francisco Bay Area). We accept all major credit cards, paypal, checks (with an extra 7-day waiting period), and cash (in-person payments for cash only, please). We ship using UPS ground (or very occasionally USPS), and shipping charges are exact, based on the weight and packaging of your items. If you don't have artwork and need our graphic design services, or if your artwork is not up to standard, we can help. We charge $100 per hour, with quarter hour increments. Often tweaks can be done in less than half an hour, and we will work with you for bigger jobs to make a fair, affordable, cost-effective arrangement. We recognize that screen printing can feel a little confusing at first, so please be assured that no question or clarification is too small. We have worked with many 'first timers' (as well as experienced folks) and are happy to guide you through the process. We're on Facebook and Instagram and Twitter, oh my.